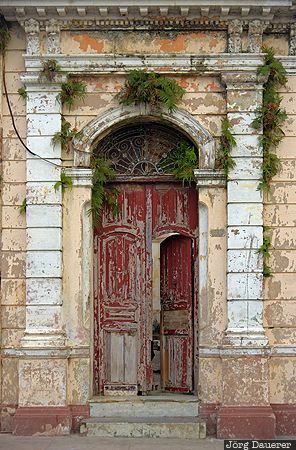 A wooden red door on a typical decaying facade in downtown Cienfuegos. Cienfuegos is the capital of the province Cienfuegos in the south west of Cuba. This photo was taken in the evening of a cloudy day in March of 2016. This photo was taken with a digital camera.